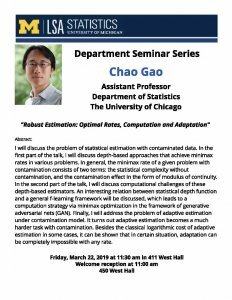 "Robust Estimation: Optimal Rates, Computation and Adaptation"
I will discuss the problem of statistical estimation with contaminated data. In the first part of the talk, I will discuss depth-based approaches that achieve minimax rates in various problems. In general, the minimax rate of a given problem with contamination consists of two terms: the statistical complexity without contamination, and the contamination effect in the form of modulus of continuity. In the second part of the talk, I will discuss computational challenges of these depth-based estimators. An interesting relation between statistical depth function and a general f-learning framework will be discussed, which leads to a computation strategy via minimax optimization in the framework of generative adversarial nets (GAN). Finally, I will address the problem of adaptive estimation under contamination model. It turns out adaptive estimation becomes a much harder task with contamination. Besides the classical logarithmic cost of adaptive estimation in some cases, it can be shown that in certain situation, adaptation can be completely impossible with any rate.